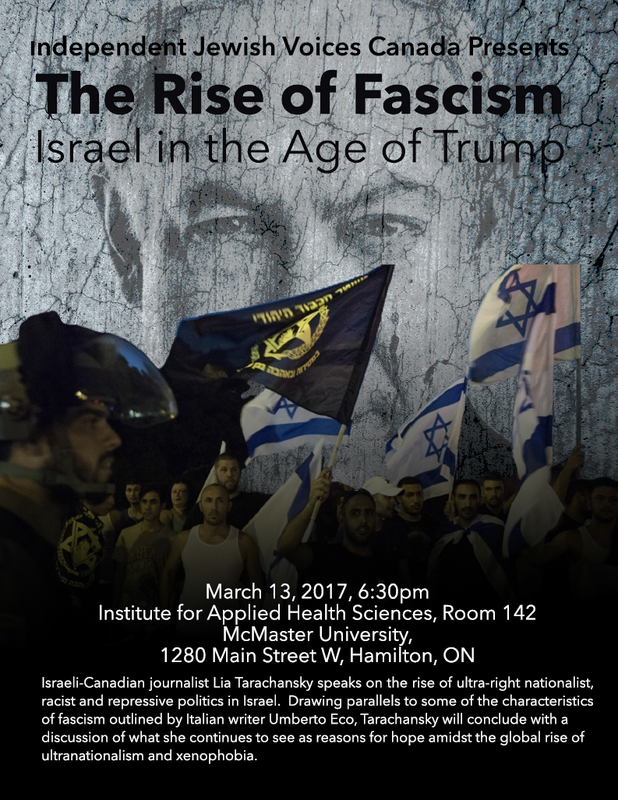 For generations, Canadian politicians have excused their unconditional support for the State of Israel by claiming that “Israel is the only democracy in the Middle East.” Thanks to successive years of Israel Apartheid Week, we now know that Israel systemically discriminates against Palestinians, not only in the Occupied West Bank and Gaza but also within Israel’s pre-1967 borders. Now, Lia Tarachansky shows how, even for Israeli Jews, the space for democratic debate within Israel is drying up and fascism is becoming the norm in Israeli politics. DIRECTIONS: IAHS is the Institute of Applied Health Sciences (#48 on the Mcmaster map: https://www.mcmaster.ca/welcome/med/campusmap.pdf), which is the building on College Avenue next to the big surface Parking Lot #1 in the science section of campus. Surface parking is $7 for the evening. A number of HSR buses from downtown go right through the centre of campus, close to IAHS, which is wheelchair accessible.